My boys are both at the age where they are discovering many aspects of adult life, including alcohol. They now go to parties on occasion and want to be like their friends. With an Italian grandfather for whom red wine is a part of most meals, we hoped that alcohol wouldn't hold a lot of mystery. However, drinking a glass with meals is a world away from knowing your limits with friends. If they are outside the house drinking, an already vulnerable young person will be even more at risk under the influence of alcohol. Teenagers may think they're invulnerable, but alcohol affects everyone differently and if they also need to take medication for their condition, this can have an unexpected effect, perhaps with serious consequences. Speaking to any child or teenager about alcohol will get you an eye roll at the very best. When they have special needs, it can also be hard for them to translate advice given to real-life situations and it isn't something you want them to learn from bitter experience. Before now when one of the boys had a party here, I ended up at A&E, accompanying a young lady (non-disabled) at her first party who had mistaken alcopop for something far less potent than it is. We were only upstairs and I'd gone down to investigate after overhearing concerned talk outside the cloakroom from her friends. What a baptism of fire for her! It was a lesson to all the teens there, I hope. With this theme in mind, and as we are closing in on the festive season, today we have a guest post from Kate Hooper of the Alcohol Education Trust, who has some top tips and resources for speaking to your children with special needs about drinking alcohol. 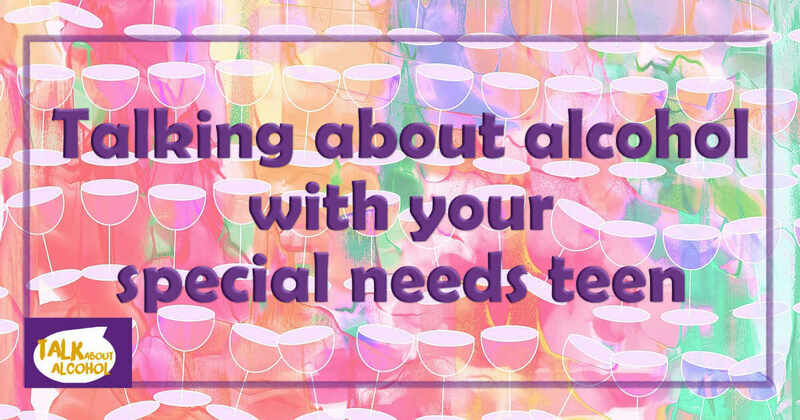 It can be hard to know how best to talk to your children about alcohol and this can be even more challenging if your child has special needs; at what age should you have that conversation? What should you say and how? As a charity providing training and resources for schools and parents, we are working with over 1500 schools and organisations across the UK and have been listed as one of the top 50 most effective programmes by The Early Intervention Foundation. We are very pleased to have recently developed a new set of school resources on alcohol, “Picture and Story Led Activities – Building Knowledge and Resilience Strategies around Alcohol”, developed specifically for children with SEND. Sadly, children with special needs are three times more likely to be abused and alcohol can be a contributory factor in grooming vulnerable young people. The set of resources is based around pictures and stories and use a common set of characters as well as emoji faces to make them fun and engaging. The contents include understanding consent and categories of risk. We have worked in partnership with the special needs specialists Image in Action to produce a teacher’s workbook and resources online. Find out more from our website via http://www.alcoholeducationtrust.org/teacher-area/visual-rich-resources/. At present, we are able to offer these resources free of charge to schools in London and Dorset thanks to grant funding. If you live in these areas, please do recommend this resource to your child’s school. We are able to support schools in other areas of the country at a small cost. If you’re interested in parent workshops or your child’s school would like more information, please contact Helen Dougan at hdougan@alcoholeducationtrust.org. Schools can order the set of resources by emailing kate@alcoholeducationtrust.org .